Such an event would allow Perry to build his profile with Christian conservatives, a group that play a key role in Republican primary politics, especially in the South and the Midwest. The playbill for the call to prayer hits all of the notes that a candidate seeking the GOP nomination would be expected to hit (see: debasement of society). And the venue selection— Reliant Stadium (a football stadium) — indicates that organizers are aiming to make a splash with the event. Beyond horrifying with words, this post hopes to cause widespread cursing at coastal computer screens via the picture, provided courtesy of the Texas Tribune, of Gov. 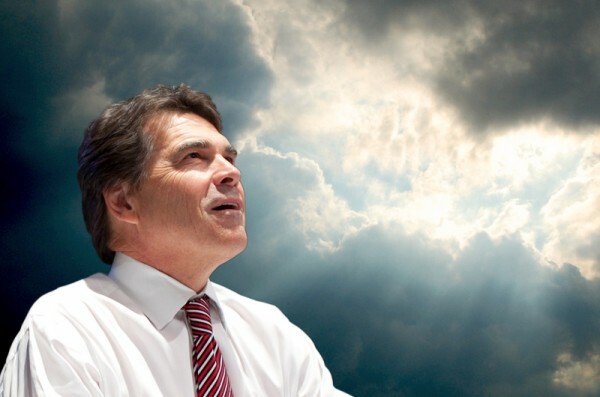 Perry, praying to the heavens. Good afternoon, elite thought leaders. And you’re welcome.